Previously unpublished lectures and interviews by the modern age's preeminent media seer--informal, accessible, provocative. In the last twenty years of his life, Marshall McLuhan published a series of books that established his reputation as a world-renowned communications theorist and the pre-eminent seer of the modern age. It was McLuhan who made the distinction between "hot" and "cool" media. And it was he who coined the phrases "the medium is the message" and "the global village" and popularized other memorable terms including "feedback" and "iconic." McLuhan was far more than a pithy phrasemaker, however. He foresaw the development of personal computers at a time when computers were huge, unwieldy machines available only to institutions. He anticipated the wide-ranging effects of the Internet. And he understood, better than any of his contemporaries, the transformations that would be wrought by digital technology--in particular, the globalization of communications and the instantaneous-simultaneous nature of the new, electric world. In many ways, we're still catching up to him--forty years after the publication of Understanding Media. 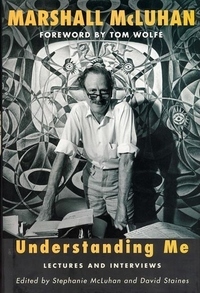 In Understanding Me, Stephanie McLuhan and David Staines have brought together nineteen previously unpublished lectures and interviews either by or with Marshall McLuhan. They have in common the informality and accessibility of the spoken word. In every case, the text has been transcribed from the original audio, film, or videotape of McLuhan's actual appearances. This is not what McLuhan wrote but what he said--the spoken words of a surprisingly accessible public man. He comes across as outrageous, funny, perplexing, stimulating, and provocative. McLuhan will never seem quite the same again. The foreword by Tom Wolfe provides a twenty-first century perspective on McLuhan's life and work, and co-editor David Staines's insightful afterword offers a personal account of McLuhan as teacher and friend.